Are you prepared for a natural disaster? Do you have a stock-pile of food? I’ve never had a real plan to build a long term food supply, but because I often buy in bulk (mainly to save money), I usually have enough food on hand for a few weeks and possibly months. There have been several times our town has been completely shut down due to severe weather. During those times, I am extremely grateful for our personal supply of food and water. There is plenty of information online about emergency prepardness, but building a prepardness pantry for people with food allergies has unique challenges. Annaliese from The Rice of Life has done a brilliant job of putting a plan together to build a year’s supply of safe food for her family for just $10 per week. While my list would look different from hers, I find it completely inspiring. Check it out here. Looking for more information on building a stock pile you will actually use? Check out The Prudent Homemaker. 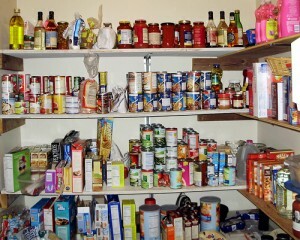 She built her pantry while they had money. Later, her family lived off their pantry when they had no income for 8 months. Thanks for sharing my post! I’m glad you found it inspiring.